Welcome to Gleeson, Arizona. Though the sign indicates a population of 100, we didn’t see a soul. Kathy Weiser, April 2007. Click for prints & products. On a dusty road winding out of Tombstone, Arizona begins the Ghost Town Trail. 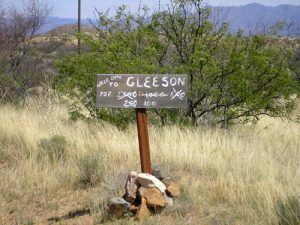 After traveling some 16 miles along this historic path, you’ll come to the ghost town of Gleeson, Arizona. 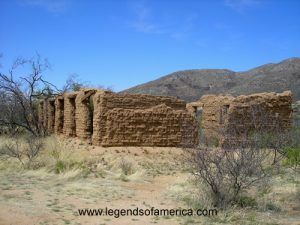 Situated on the south side of the Dragoon Mountains, Gleeson was first inhabited by Indians who mined the area for its decorative turquoise. When white prospectors began to move into the area, they found copper, lead, and silver in the area and before long a mining camp sprouted up in the hills above where Gleeson stands today. The first camp was called Turquoise when a post office opened in 1890. However, just four short years later, when Jimmie Pearce found gold at the Commonwealth claim in what would become Pearce, the town of Turquoise was abandoned and the post office closed. Then, in 1900, a Pearce miner named John Gleeson began to prospect the Turquoise area again. Finding large deposits of copper, he soon filed several claims and opened the Copper Belle Mine. In no time, more miners flooded the area and new mines with names like Silver Belle, Brother Jonathan, Defiance, and Pejon also sprouted up. The new mining camp which moved down the hill to be closer to water was called Gleeson. On October 15, 1900, the post office opened, supporting a population of about 500 people, almost all of which worked in the mines. 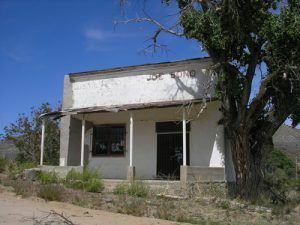 Joe Bond’s Gleeson Saloon, Kathy Weiser, April 2007. Click for prints & products. In 1912, a fire raged through Gleeson taking with it some 28 buildings. However, with the mines still producing ore in large volumes, it was quickly rebuilt. John Gleeson sold out in 1914, but the copper production continued to flourish, especially during World War I. After the war was over; however, copper prices began to fall, ore production decreased, and by the 1930’s the mines had all shut down. 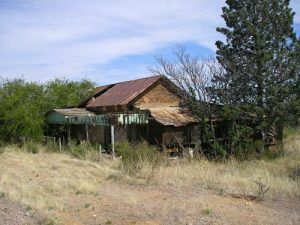 Most of the population moved on but Gleeson’s post office held on until March 31, 1939, when it too, shut its doors and Gleeson became a ghost town. 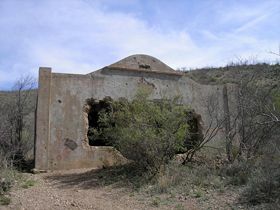 Today, the old settlement still supports a couple of residents as well as numerous ruins, including a hospital, a saloon, dry goods store, several houses, a jail, numerous mining remnants, and the large foundation of what was once a large school. The Gleeson cemetery is just west of the town on the road to Tombstone. Continue your trek through Gleeson on Gleeson Road. Just a mile or so beyond the town, you will come to Ghost Town Trail Road, where you will turn north to continue to Courtland and Pearce. All along the dusty road, are remnants of the area’s more prosperous past. Courtland is just about 3.5 miles down the road. A crumbling house in Gleeson, Kathy Weiser, April, 2007. Click for prints & products. 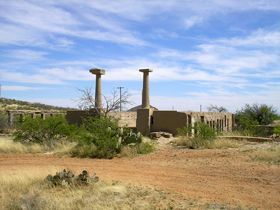 Ruins of school in Gleeson, Arizona. 2007. Click for prints & products. Gleeson Jail, Kathy Weiser, April, 2007. Click for prints & products. 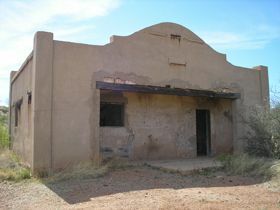 The old jail in Courtland, Kathy Weiser, April, 2007. Click for prints & products. Interestingly, though Courtland got its start later than nearby Gleeson, it grew to four times the size. Even more interesting is that this once larger town, which actually died later than did its nearby neighbor, has far fewer remains. Getting its start in the early 1900’s, miners flooded the area to work for the Copper Queen, Leadville, Great Western, Calumet, and Arizona Mining Companies. One of the largest companies, the Great Western, was owned by W.J. Young, who named the quickly growing settlement for his brother Courtland. In March 1909, a post office was established and before long, the town boasted a population of some 2,000 residents who supported two newspapers, several stores, a Wells Fargo office, and the Southern Arizona Auto Company. The Mexico and Colorado Railroad also arrived from Douglas. For amusement, the town provided a movie theater, an ice cream parlor, a pool hall, and a swimming pool. 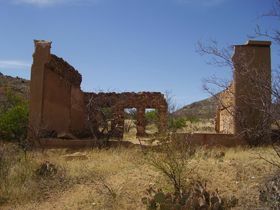 Ruins in Courtland, Dave Alexander, April 2007. Click for prints & products. But, like the other area mining towns, Courtland’s mines played out and then so did the town. Though it hung on through the Great Depression, its post office finally closed in 1942. By that time, many of its building had already been razed or moved. What was left was quickly claimed by the desert. Today, Courtland’s only remains are the old jail, a collapsing store, a number of foundations, and plenty of mining evidence testifying to its more prosperous times. The hills surrounding Courtland are pocked with mines and old shafts so visitors should beware that hiking in the area could be hazardous. Another 10 ½ miles on down the road, you will come to Pearce, the only one of these three ghost towns that continues to maintain its post office.